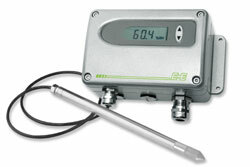 The EE23 industrial transmitters from E+E Elektronik measure relative humidity and temperature and also calculate the dew point and frost point temperature. The new model EE23-T5 is suitable for a temperature range of -40 °C to 180 °C (-40 °F to 356 °F) and thus expands the application range of the proven transmitter series. The high-quality E+E humidity sensor with optional sensor coating ensures most accurate and long-term stable measurements. The EE23 series includes models for wall or duct mount as well as different remote probe versions. This makes the transmitter series particularly versatile. Depending on requirements, the devices are available with a robust IP65 / NEMA 4 rated polycarbonate or metal enclosure. The three parts enclosure design facilitates easy installation, service and replacement of the EE23. The enclosure consists of the back cover with the terminals for wiring, the pluggable active part with the electronics and the probe, and the front cover. For service only the active part needs to be replaced, while the back cover with the wiring remains untouched. The E+E proprietary coating protects the sensing elements against corrosive and electrically conductive pollution, which leads to outstanding long-term stability even in harsh environment. There is also a wide choice of filter caps available. The measured data is provided on two current or voltage outputs. An optional relay can be used for alarm and control tasks. A display and an integrated power supply module are further optional features of the EE23 devices. The user can easily perform a two-point humidity and temperature adjustment. The analogue outputs and the relay output can be freely configured.